I got This book at a garage sale in June, and it looked like a good short read that sums up the career of Conan. 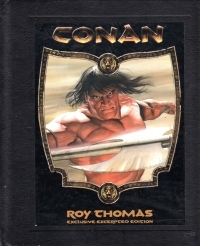 It is indeed a chronological history of Conan taken from some comic book series or several, which means in addition to the canonical material there are some references to other stories not written by Robert E. Howard. The text is presented in a legendary history sort of fashion, with the non-Howard stories blended as more legend and the Howard stuff as more history. For Pete’s sake, I almost had to go out and buy a pair of cheaters for this book. Or an electron microscope. At any rate, it’s an interesting and brief book on the history of Conan and features some interesting art work from the comic books, but the book’s format itself hinders it quite a bit. 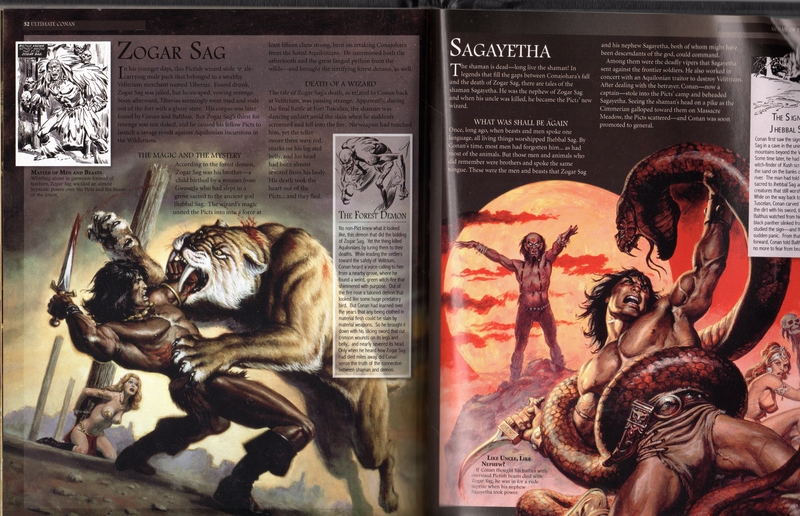 Go for the full-sized Conan: The Ultimate Guide to the World’s Most Savage Barbarian instead. This just in: Meat is not a petroleum product. Shortly after reading Last Seen in Massilia, I rediscovered this book on my to read shelves. So I thought I’d take on a thicker tome. Well, if you’re classically educated and over forty, you might well know how the book turns out from its title. For those of you too young or too public school to know, the three legions were Roman legions defeated by an alliance of German tribes in the Battle of Teutoburg Forest in 9 AD. The Romans never recovered the German territory lost. At any rate, this book covers a couple of weeks leading up to the battle. The Proconsul is vain and overconfident. The commander of the Eagle legion is smitten with a woman captured in the raid of a small German outpost who craves to be taken care of in a Roman way. Another lesser leader craves the first commander’s position. A brutal but effective legionaire flouts the rules and rules by fear. 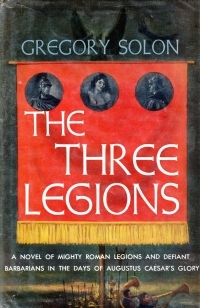 The legions’ historian is eager to write a scholarly treatise about the downfall of the legions even though he does not believe it to be true. Then the proconsul demands the German woman and an Achilles/Agamemnon storyline breaks out as the commander is stripped of his position and his self-definition. The lesser leader takes command and leads his men into disaster, and then the army decamps into a disastrous ambush in Teutoburg Forest. The book is deep and well-written with a lot of characterization and a lot of detail about life in the Roman legion. It was not as expository as Last Seen In Massilia, either, and the book delved into the politics of not only the Romans but also the Germans who were unsure about uniting under a leader to attack the Romans when the Romans were not actively at war with the tribes. I liked the book a lot, and I was sad to discover that the author appears to only have written this two novels. The second is a contemporary (to its time, which is 1958) book entitled Let Us Find Heroes; I will keep an eye out for it. I previously read this book in May, 2011. 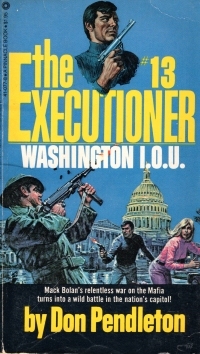 I didn’t have much to say about it then other than it was a stock men’s adventure novel with shooting and explosions. In it, Bolan goes to Washington and uncovers a Mafia-run blackmail ring designed to lure in important officials, elected and unelected, into a videotaped tryst and then controlling those men to the mob’s gain. Bolan rescues an attractive widow who had second thoughts about her role in the scheme and was targeted for a hit because her change-of-heart came with a plan to bust up the operation. A Bolan imposter shows to kill the blackmailees and set Bolan up for a frenzied law enforcement manhunt, but Bolan eludes capture and tracks the operation to its lair and rescues the girl, implicates a congressman, and discovers that the hidden figure behind the scheme was the “widow’s” husband. So it’s one of the Pendleton books of the series, which puts it a cut above a lot of men’s adventure books. Additionally, as I think about it, the men’s adventure series (and comic books) paved the way for the arc of modern television storytelling. These are episodic, but with continuing plot lines that build and crest over the course of a number of books. So while I ding modern hardback fiction for being informed by television, I have to do the opposite for men’s adventure books. They set the pace, and they’re cheap little paperback designed for quick consumption and discard. Is that a double standard on my part? I don’t think so, but I’ll have to think it over further. So this book is worth a read if you’re into this sort of thing. You can definitely do worse with the genre. I’d been suffering from low energy levels and a bad mood, and I asked my doctor about it. “Do you have children?” he asked. “Do you order and eat a lot of cheese pizzas?” he asked. It turns out I was suffering from low T, low Toppings. The doctor gave me a prescription for a pizza with all the toppings, including pepperoni, sausage, green peppers, onions, olives, and bacon. With regular consumption of pizza suitable for a man, I feel great! My energy level is higher, I can lift the back ends of small cars (although not Priuses because of the extra weight of the battery), and an increased drive to talk about pizza with lots of toppings. Additionally, my beautiful wife has noticed a change in me: my breath after eating a T-laden pizza contains elements of the aforementioned ingredients. So if you suffer from low T, do what I did: order a deluxe 4 meat pizza. Make sure the total for the pizza with all toppings comes to at least 20 bucks. Ordering a T-laden pizza is not for everyone. Do not feed a T-laden pizza to your baby if you’re breastfeeding. Do not drink alcohol with INXS when eating a T-laden pizza. A choice of pizza toppings is important and should not be decided by advertising or wry blog posts. Pineapple does not count as a T-laden topping. Standard restrictions apply. Jeez, what kind of advertising am I going to see on the Internet now that I’ve searched for low T and AndroGel on the Internet to shape this bit of satire? For Pete’s sake, the government is going to put this in my permanent electronic health record over a JOKE! Wait, let me point my supposedly turned off Web camera at the floor where I’ll do some pushups to show I’m really okay. No, please, nobody wants to see me TURN IT UP. As you might remember, gentle reader, I like to pick up a Christmas book now and then around the holidays to see if I can get a touch of the old Christmas feeling instead of the modern, I’m-the-adult-providing-the-old-Christmas-feeling-for-my-kids feeling. So I bought this book at some book fair in the recent past, and as it neared Christmas, I picked it up. It’s a short little book (as Christmas novels are), and it’s blurbed by Glenn Beck. Jeez, getting your books because Glenn Beck liked them might be as risky as getting a book Rush Limbaugh mentioned it. The story revolves around a girl who was found in a diner on New Year’s Eve. The woman who found the baby adopts her and then dies of cancer. The woman who had been the baby is now a reporter for the local paper. Her apartment gets burglarized not long after her adopted mother’s death, and a jar of coins appears on her doorstep. She investigates the jar and discovers others have received similar jars in past years. When the next recipient receives one, the intrepid reporter contacts the recipient and is given a clue to who might be behind it. She talks to a family that runs a furniture restoration business out of its garage and becomes close to them, enjoying their family occasions and traditions even as she frets about getting to know them under false pretenses–she pretended to be a college student doing a piece on small business instead of an investigative reporter. She learns the family is behind the jars and does an expose on them, and then avoids them. 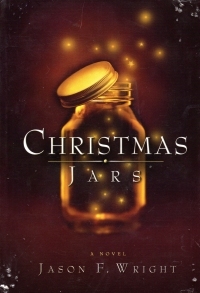 The father of the family dies, and she reconnects with the family just as a parade of other people who have begun filling the Christmas jars leave them with the family. Including, of course, a woman who proves to be the mother of the adopted girl. It’s an interesting plot, good enough for a Christmas novel, but unfortunately the execution is a bit….underdone, overt, melodramatic. Something. The characters are not very deep, and the events move at a pretty quick and sudden pace. It’s not the best of Christmas novels ever, but on the other hand, Glenn Beck blurbed it and it undoubtedly sold more copies than my only published novel. So. I received an ABC Books gift card for Christmas, and it took me all of two days to get across town to spend it. Because I’m into delayed gratification. Gift cards are strange creatures; when I have a gift card for anything, it takes me a bit of time to spend it because I’m worrying about whether to get this rather than that. So I wandered the aisles a bit at the outset of my journey, wondering how I would spend the whole amount–$100, so not a small amount. So I picked up four paperbacks tied to the old television show Kung Fu, which totaled like fifteen dollars, and wandered around through the fiction, drama, and poetry sections, but nothing caught my eye. I went looking for the philosophy section, and before I got there, I found a shelf of Easton Press/Folio Society books at 25% off. Well, that’s a way to spend some money. I picked up Julius Caesar’s The Gaulic and Civil Wars, which I meant to add to my Christmas list after reading Last Seen in Massilia, and William James’s The Varieties of Religious Experience. I put back a couple that I might try to acquire sometime in the future. The six books in hand ate up the gift card, so of course I picked up a couple more, including Zane Grey’s Wilderness Trek and, having finally found the philosophy section, Existentialism and Thomism. I also picked up a couple comics and learned they were $1 each; the titles include things based on old serials (Conan, Doc Savage, Tarzan, Flash Gordon), an X-Men 2099 title, and the first issue of an undoubtedly short series tied into the television cartoon MASK. 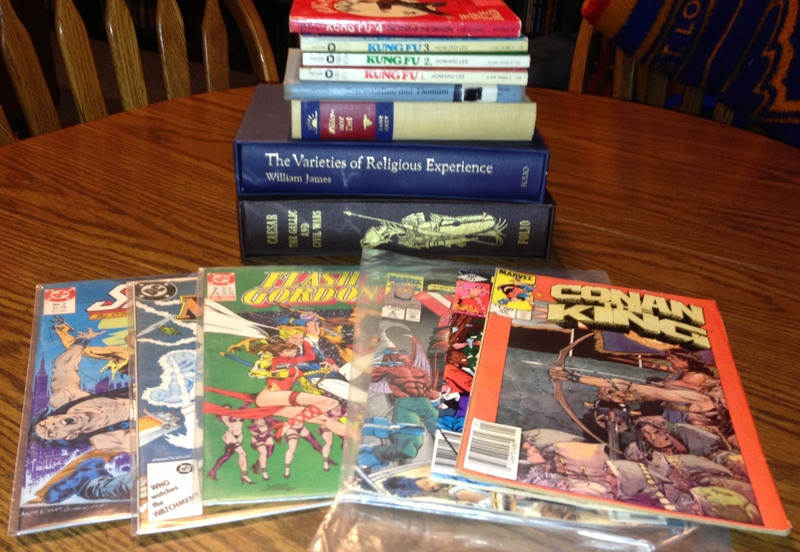 It was a good trip; as so many of these are wont, they make me want to read a bunch. So if you excuse me, I shall. White House: ‘Sophisticated actor’ hacked Sony. The hardest part about making fun of this headline is that I can’t think of a living actor I’d call sophisticated. Maybe Morgan Freeman. George Clooney? Almost. Help me out here. Who do we have that’s sophisticated? Gentler reader, I know I’m not saving the best for last in presenting this album on December 12, but this is the best Christmas album of all time. 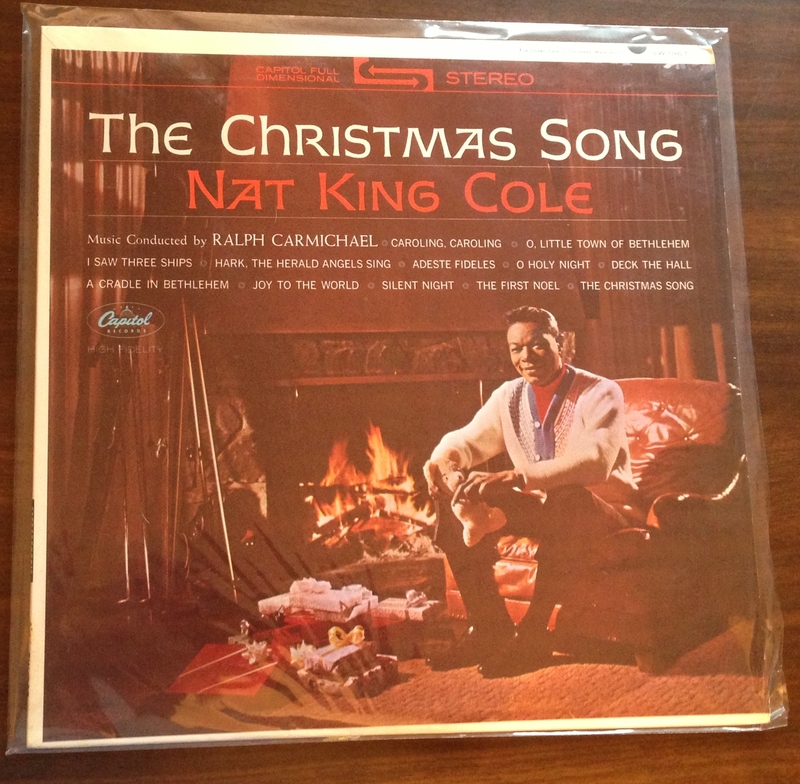 This album makes me wish Nat King Cole were my dad, okay? His warm, smooth voice infuses all of these tracks with a hominess that makes all of them mood music. Or better yet, primary music: you want to put the record on, stop what you’re doing, and just listen to it. If I had to gripe, I’d say the version of “Deck the Halls” is a bit manic, but, hey, who hasn’t been a touch manic getting ready for a big party. The modern CD rendition of the album features five extra songs and opens with a spoken Christmas greeting. Yes, I have both. Let that be your guide as to whether I recommend it or not. The online article doesn’t include the photos that the magazine does, but, Heavens to Betsy, it almost makes me wish I lived in NYC just so I could go to that hat store. Here in the Midwest, hat stores are pretty rare; there’s one I visited in Kansas City last year that’s good, and Donge’s used to be good in Milwaukee before it closed up. I’m sure I have previously noted I’ll buy shirts off the rack and slacks and jeans from the stack at Walmart without trying them on, but if I get into a hat store, I have to try on pretty much every fedora in the store before selecting one after much consideration. So perhaps it’s best I generally have to order hats by mail these days. The actual elapsed time including days of reviewing options and several go-rounds of ordering, trying, and returning is probably more efficient than me going into a hat shop and browsing. 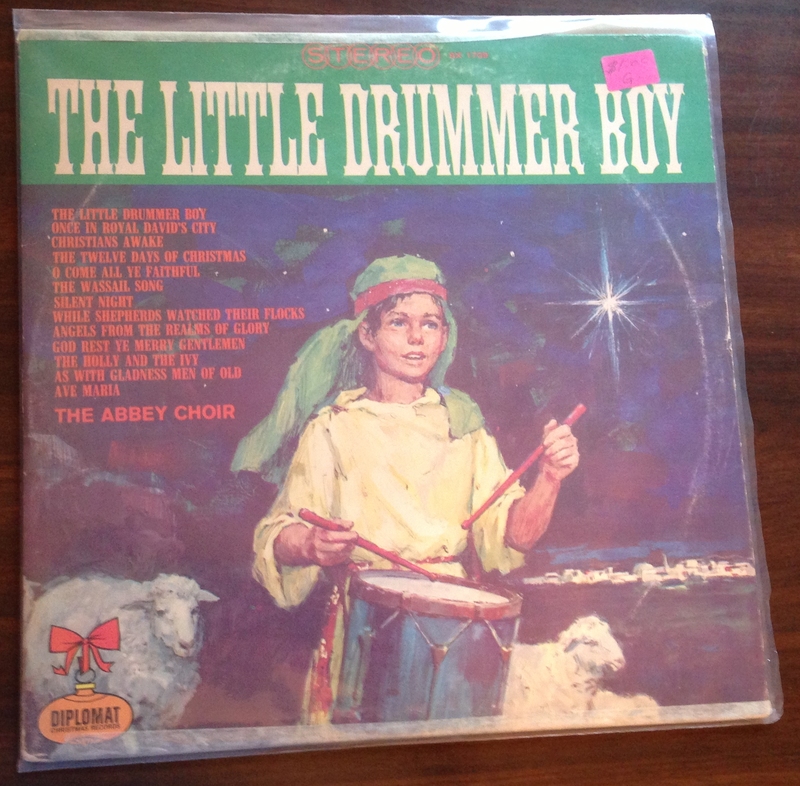 This album includes the definitive version of “The Little Drummer Boy” in my mind. When I was a little boy, I had a book with the lyrics to the song along with some pictures of what’s depicted in the lyrics, and when my mother played this album, the song came to life. Or so I thought at the time. The truth of the matter is that this disk is a collection of choir renditions of some common Christmas carols and some uncommon ones. For the most part, I’ve reviewed individual artists’ albums and collections of individual artists’ songs, but the choral album is integral to the whole Christmas experience, and you can’t hardly go wrong with them as background music. This album gets plenty of play in the household. And, apparently, it’s available on MP3s for you 21st century types. Like the Ace of Spades. 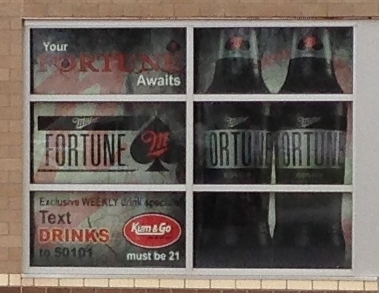 As anyone who knows anything about fortune telling could tell you, the Ace of Spades card means misfortune or death. I’m getting awfully damn curmudgeonly, but I loudly suspect our younger generation is even getting educated poorly in superstitions and pseudo-science. This album is a Reader’s Digest compilation that collects a number of popular tracks from Bing Crosby. 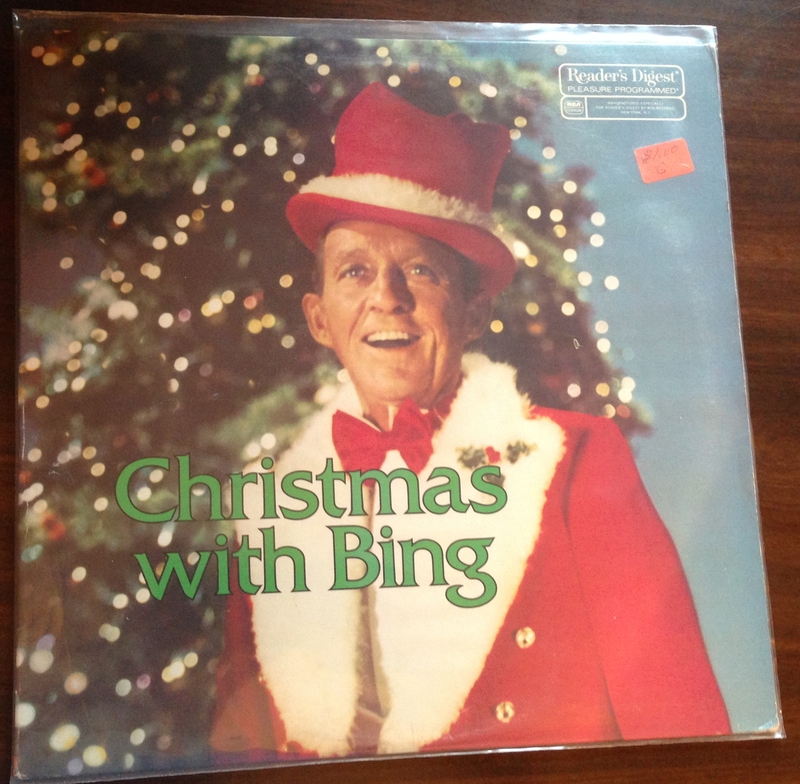 Jeez, I feel a little weird here, wondering if I have to explain who Bing Crosby is to you damn kids. You know him for his rendition of “White Christmas”, which he originated in the film Holiday Inn and then again in the film White Christmas. But, for Pete’s sake, you know he was a big time recording artist, the father of all pop music and music recording, and a hip enough fellow that he poked fun at his hipness and its own aging in the film High Time when the man was older than my father ever was. He’s Bing Crosby, &%^$&*! What’s missing? The aforementioned “White Christmas”. Instead, we get a treat that doesn’t appear often elsewhere, “Christmas Dinner, Country Style” about a large family gathering	for a meal. The song is a treat; the others, standards. You’ll find them elsewhere, on compilation collections, but it’s fine to have them on a single platter to have as either background or mood music. 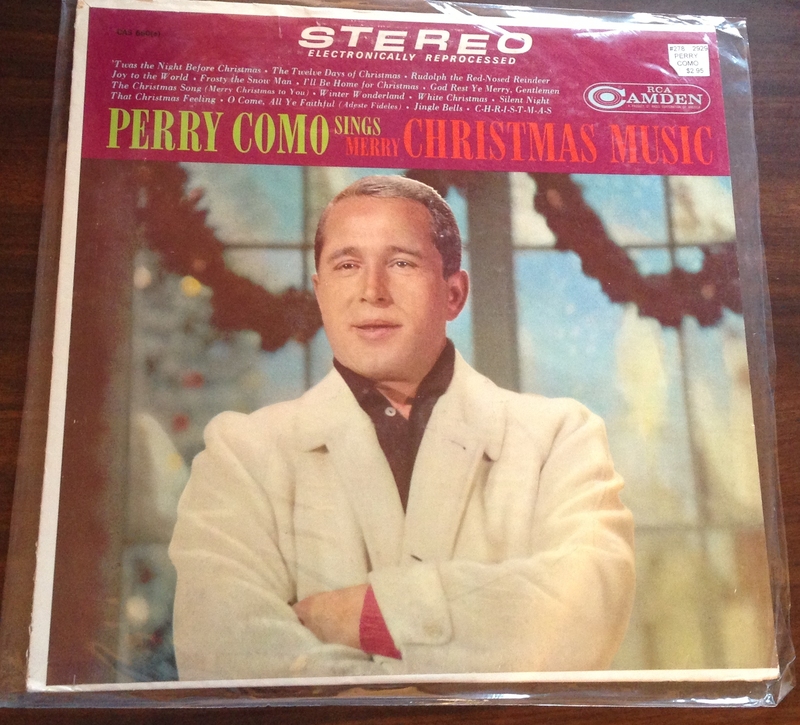 I mentioned that you don’t find Perry Como albums outside the Christmas work in book fairs, garage sales, or antique malls in southwest Missouri often. You do, and by “you do” I mean “You might if you get there before me,” find the occasional Bing Crosby album in the wild. I suppose that’s because he sold more albums than Perry Como did. Or maybe it’s just because that’s what I’ve found. Regardless, this album should be pretty widely available since it’s a Reader’s Digest pressing. You could do worse, and probably will with anything you buy with a copyright date after 1980. It’s strange; Perry Como was pretty popular in the early part of the 20th century, as he released records and starred on television, but you rarely see his albums in the wild. My mother owned a copy of this album, and I guess it must have sold for a buck at one of her garage sales as I had to buy my own copy. At an antique mall. For $3. That’s how fondly I remember the album from my youth. I spent three dollars on it. Como has a baritone voice and inhabits the songs much in the way his early influence Bing Crosby does. As such, he does a great job with the Christmas music. This is definitely a definitive Christmas album to own, as Como really was associated with Christmas television specials into the 1980s and beyond (apparently, his last was in 1994). Unfortunately, my copy sticks, so I’m in the market for a replacement for it. And I’m willing to pay $3 for it. It’s an interesting bit, an enjoyable little read from the era–the middle 1960s through, what, the 1980s? where the future is dystopian and overcrowded and the plots are novel and clever. The book collects three stories, only the third of which I would call novel or clever. The other two are run-of-the-mill apocalyptic bits that put Man in his place. “And Us, Too, I Guess” by Geo. Alec Effinger, which presents a scientist and a working man who wants to breed fish in parallel story lines in the near, dystopian future, when the “scientists” (who work in their own labs on simple experiments that only recreate past discoveries) discover that a single species is dying every day (and might have been for a long time). Hey, here’s the shocking ending: MANKIND DIES. Because of nature or maybe what mankind did to it. 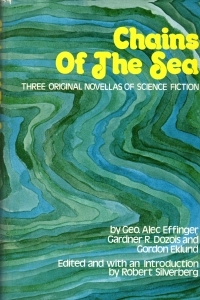 “Chains of the Sea” by Gardner R. Dozois, in which aliens invade, but nobody can see them. A child, however, who has maintained his imagination even beyond his very early years in the dystopian near future can see the “Others” which are intelligent species that adults cannot perceive. Through them, he learns that the aliens have come to renegotiate compacts with the other species and with the new species, the artificial intelligence in human networks. In a moment of poignant coming-of-age drama for the lad, MANKIND DIES. Also, I’m not sure what the title means or how it applies to the story. “The Shrine of Sebastian” by Gordon Eklund tells the story of a reluctant “pope” of a decadant church is tasked by the previous, newly deceased “pope” with burying her remains at the shrine of Sebastian, a future profit who convinces mankind that it should leave the wasteland of the Earth behind. Most men do, but some remained with the robots in a decaying society. Then, MANKIND DIED. Sorry, I was going on habit there. In this case, the things that thought they were human discovered they were Androids, like Sebastian. Mankind might have survived, somewhere out beyond the sky, but here on Earth, ROBOT AND ANDROIDKIND WILL DIE. Most people think of science-fiction as being about the future; it’s a genre that explores possibilities, from Dr. Frankenstein’s invention of artificial life to Ursula K. Le Guin’s world populated by humans who have all evolved into single-gendered hermaphrodites. What might happen if? What could happen when? Sci-fi thinks about new technologies, new societies, and new ways of being, good or bad. And then science-fiction fans turn to the new Star Wars trailer, and find, not the future, but a reshuffling of 30-year-old detritus. Read enough of the C-List science fiction from the past, and you’ll learn that the best of science fiction sticks with you but most of it, especially the pedestrian stuff, falls away from you mostly unremembered. A lot of the old stuff retreads common tropes just as much as new stuff does; we just forget it if we even bother to read or to have read it. So I won’t remember these stories much, but innovative and imaginative stuff from the era will still captivate me. And in time, I’ll recycle my line about how all the science fiction from the past is better than all the science fiction now. Because I’ll mostly remember the good and won’t remember this particular volume much at all. This album is the Steve Lawrence and Eydie Gorme Christmas album. 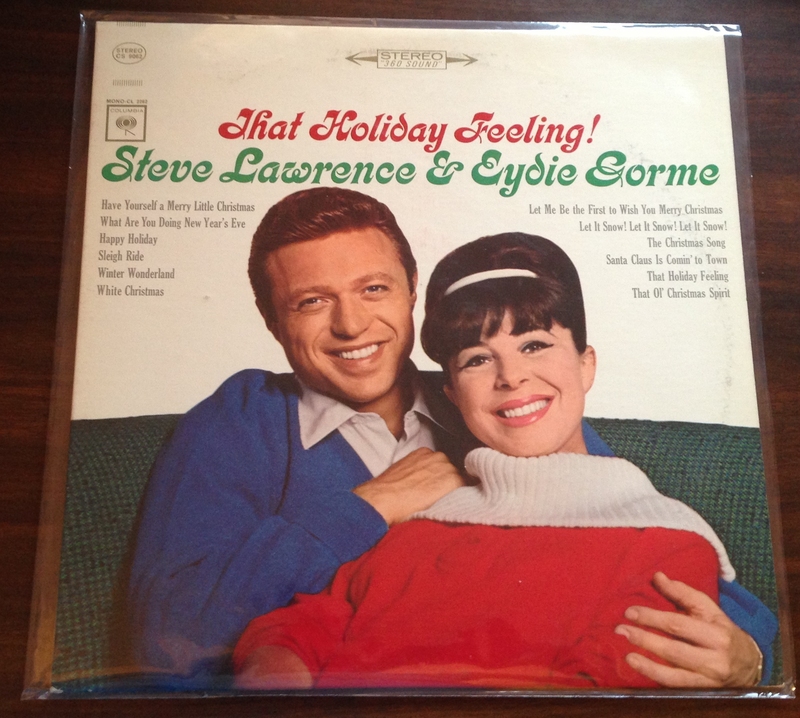 No, I’m not emphasizing it enough: this is the Steve Lawrence and EYDIE GORME Christmas album. Too subtle? It’s the Steve Lawrence and Eydie Gorme Christmas album. Listen, bub, they’ve taken the <blink> tag away, so I don’t know how much more clearly I can make it: I’m an Eydie Gorme fan, and I was very happy to find this album this year. Oh, her husband is okay, too. But he’s not Eydie Gorme. “What Are You Doing New Year’s Eve?” has become a jazz/songbook standard of sorts and makes its appearance mixed into Christmas carols on the radio, but I don’t have many renditions of it on LP. “Let Me Be The First To Wish You Merry Christmas” might be the only representation of that song I have available, and “That Ol’ Christmas Spirit” is infrequent enough to be a treat when it appears. As you would expect, especially if you’re familiar with the LPs where Steve and Eydie appear together, the songs are duets in most cases and they switch off primary duties on the songs. Their version of “Sleigh Ride” is particularly fun, with Steve singing the lyrics and Eydie chanting “Sleigh Ride” at the end of lines. Sadly, their laughter at the end of the song is forced and a bit desperate and maniacal. Gorme’s voice is expressive and fun, and Lawrence’s is warm and engaging as well. It’s definitely mood music; something worth listening to with a bit of focus. As I mentioned, I only bought this album this year, but it’s already in the rotation here at Nogglestead as often as I can get away with without making my wife fear I have an unhealthy obsession with Eydie Gorme. Health advocates applauded new federal school nutrition guidelines that began taking effect two years ago, but students are grumbling, mainly older students long used to their hamburgers and nachos. Disgruntled teens are sharing unappetizing pictures of their lunches on social media under the hashtag “ThanksMichelleObama” — a sarcastic nod to the first lady, who championed the changes. At Parkway and other districts across the area, as many as 20 percent fewer students are buying their lunches. Statewide, the number of lunches served has dropped 11 percent since the 2009-10 school year, according to the latest figures from last year. In these modern times, we can all celebrate that government programs are benefiting fewer people, but in a better way than ever before. Expanding lunch programs so that every student can get a healthy mid day (and often breakfast) meal. Compelling healthy meals according to the latest phony baloney studies. However, the number of students eating the meals is declining. Which probably means they’re eating something less healthy. Never fear, though; whenever government’s mandates conflict, more mandates are the solution. If students are choosing not to eat the healthy meals, why, one only has to make consumption of the healthy meals compulsory to solve all the problems.